–EVERY artist knows the importance of a daily sketchbook. My problem has been that I often don't have my sketchbook handy when I need it. 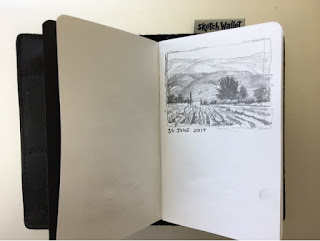 I recently stumbled on a solution called Sketch Wallet. As the name implies it's about the size of a wallet and has a sketchbook inside (as well as space for a small pencil) and slots for a drivers license, cash, and credit cards. Since I never leave home without my wallet, using the Sketch Wallet will make sure I always have a sketchbook with me. The Sketch Wallet comes with a sketchbook insert with 52 pages. I think I will only sketch on the right side opting to use the left side for notes. The paper is robust, taking erasure without problems, and their website shows several artists using ink with the paper, which looks like it works quite nicely. The pencil is a bit too hard for my tastes so I will carry a pencil case to hold my gear, including woodless pencils, a kneaded eraser, and a Pentel pen with an extra cartridge. I'm excited to use this new product that came into being via a Kickstarter campaign a year ago. 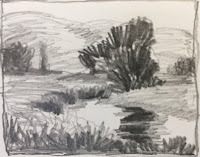 I've been a bit lax with my sketchbook–missing many choice opportunities to record quality compositions over the years. This product will help me hone my drawing and compositional skills while creating a great library of imagery to energize my landscape painting. Just as a smartphone ensures having access to a camera 24/7 I now have my sketchbook with me at all times. Many thanks to the people at Sketchwallet.com.